I reported the talk about his robotic cars given a couple of weeks ago by Stanford’s Sebastian Thrun – [Link]. 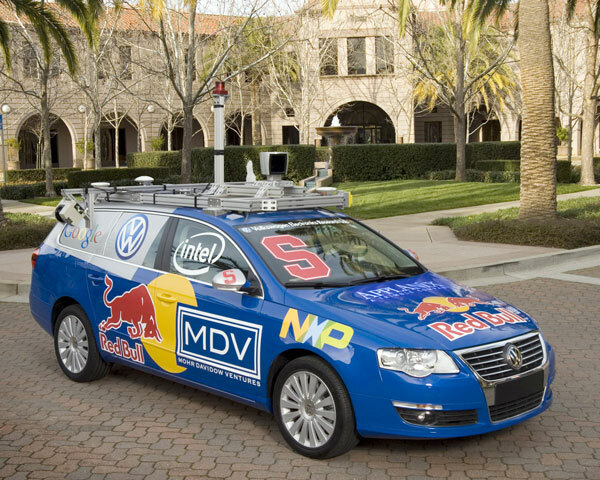 “Stanley” and “Junior” had competed and won two DARPA Challenges to build autonomous vehicles – cars capable of driving themselves in complex real-world environments. DARPA – the Defence Advanced Research Projects Agency – only pursues radical innovation. Revolutionary, deep innovation. “DARPA hard” has become shorthand for seemingly impossible, intractable problems. DARPA hands out several billion dollars of sponsorship a year. Its projects can claim key roles in the development of the internet, user interface design, as well as a host of military technologies. How does DARPA generate innovation? Plenty have their own answer to this question, but there have been few serious in-depth studies. Today I heard Tamara Carleton present her doctoral research into the role of “vision” in DARPA innovation. I’ll let her present all the details of her fascinating work, but something grabbed me. It was that “consensus” plays little part. Peer review, for example, where experts are called on to criticize and judge the quality of research, only stifles innovation. This doesn’t mean that experts aren’t needed, just that vision and risk-taking leadership in the face of orthodox consensus are crucial to radical (technological) change. I think this is more than a recap of the likes of Thomas Kuhn’s notion of normal science, established and institutionalized practice and discourse that excludes even the possibility of new questions. There’s lots of caveats, of course. Nevertheless I was reminded of an argument I had with my Professor at Cambridge. Towards the end of his career, Grahame Clark reflected on a broad view of human history. He had produced a pioneering work of comparative history in his “World Prehistory” – first published in the 60s (and still available [Link]). In his work “Symbols of Excellence” (1986) he considered precious materials and art objects, connecting them to hierarchical and class society. He basically argued that “fine art”, original human creativity, usually occurs in highly structured and strongly divided societies. This is what I took issue with. I think creativity and innovation are quite common. They are part of being human. What needs explanation is not why innovation occurs, but why there isn’t more. Another aspect of Clark’s argument occurred to me again today – that of the recurring role of elite groups of individuals in creating history itself. History was invented by the kings of the Near Eastern city states. Lists of goods and lists of deeds, the topics of early writing systems, turn into the telling of the story of a king’s great deeds, surpassing all others, going where none had dared before, challenging, original, innovative. Wider and familiar implications concern the origin of innovations – often coming from peripheries, or from sources considered wayward, even deranged by the majority. Chuck House, who was examining the dissertation with us, recalled Douglas Engelbart, pioneer of many computer innovations, including the mouse, often funded by ARPA (DARPA’s earlier incarnation), and quite barmy in the eyes of his funders.